The six thousand dignitaries and diplomats attending the ceremony inside Notre Dame Cathedral in December 1804 were witness to the culmination of an extraordinary man’s rise to total power from relatively humble origins. In an imperial extravaganza costing an estimated $20 million in today’s money, Napoleon Bonaparte became Napoleon I, “by the grace of God and the Constitutions of the Republic, Emperor of the French.” The ambitious military careerist, supporter of the French Revolution, hero of the 1796–97 Italian campaigns, and First Consul, now elevated himself above the hereditary kings whose ancien régime he had rigorously opposed a few years earlier. Taking the crown from the hands of Pope Pius VII and placing it on his own head, the new sovereign signaled that he would be under no one’s authority, religious or otherwise. Sidelined, the pope could only offer a blessing and an embrace, quietly disappearing before the oath of office was performed. Napoleon’s colossal arrogance was guaranteed to inflame some Europeans. Beethoven, for one, did not approve of the transformation from man of the people to imperial icon. Once a staunch supporter, in fiery indignation he scratched out the title to his Third Symphony. We know it not as Bonaparte, as originally conceived, but as Eroica, in dedication to heroism in general and “to celebrate the memory of a great man”—perhaps the earlier Bonaparte of the composer’s admiration, or more likely Prince Louis Ferdinand of Prussia, who had died a hero the previous year. Beethoven’s diametrical responses—great appreciation and profound dislike—were not atypical of the range of emotion Napoleon engendered, sometimes even in reverse. Take, for example, the British military doctor Barry O’Meara, who was one of those who attended to Napoleon during his final exile on the remote South Atlantic island of St. Helena. At first the prisoner’s enemy, he became an unabashed devotee. How did “Le Petit Caporal” become, in French literature scholar Gérard Gengembre’s words, “charismatic leader, master of war and peace, restorer of Catholicism as state religion, a messiah taking unto himself the symbols of both the Republic and the Roman emperors,” yet also the seemingly heartless commander who abandoned his Grande Armée in the freezing Russian winter of 1812? Gengembre quotes the French novelist Stendhal, who, though he served as a soldier in that campaign, wrote, “I am filled with a kind of religious sense merely by daring to write the first sentence in the history of Napoleon. He is quite simply the greatest man who has come into the world since Julius Caesar.” How, following his exile and death in 1821, did the emperor reemerge, in Chateaubriand’s words, as a “hero of fantasy,” the “Charlemagne or Alexander of medieval epic”? 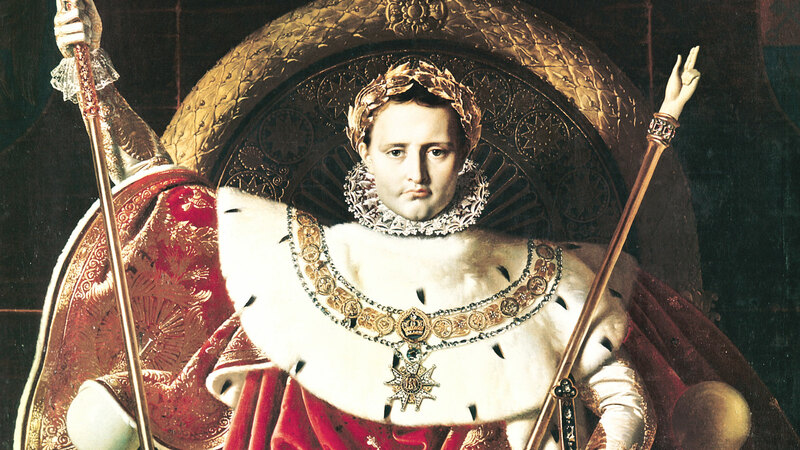 The subject of more than 100,000 books, Bonaparte’s story still fascinates two centuries later. How did he do it? At one level there was the fortuitous favor of friends and mentors, convenient opportunity, the public’s gravitation toward the leader it seeks, romantic sensibility, and the human proclivity to create legends. At the personal level, the answer surely lies in a combination of Napoleon’s military and administrative talent, overweening ambition, opportunism, and self-propagandizing. The latter, involving careful control of his image, was one of the tools he and his supporters used to great effect to further his goals, consolidate his hold on power and promote his deification. From 1796, when he orchestrated gratitude and respect for his victories in Italy, to the managed accounts of his campaigns from 1805 to 1815 (Bulletins de la Grande Armée), to the famous battle paintings, to the founding of a dynasty, Napoleon directed his own publicity for maximum effect. Even French historian Emmanuel Las Cases’s Mémorial de Sainte Hélène (1823)—the posthumously released memoirs from the emperor’s first year and a half in final exile—played its role. It became a kind of sacred text to his admirers. Born in Ajaccio, Corsica, in 1769, the second surviving child of a minor Corsican-Tuscan lawyer-nobleman, Napoleone Buonaparte (he adopted the spelling “Bonaparte” only in 1796) was hardly destined by lineage to rule most of Europe. In 1779, his father took advantage of the recent French annexation of Corsica and sent him to school in Brienne, France, where he spent five and a half years before nomination to a finishing year at the Military School in Paris. His graduation in September 1785 came eight months after the death of his father. Though he was not the eldest son, Napoleon was chosen as head of the family before his 16th birthday. Returning to Corsica a year after his commissioning, he remained until mid-1788, when he rejoined his regiment on the cusp of the French Revolution. His political views had developed to the point of feeling that political change had to come, though his military career seems to have prevented his support of social upheaval. Developments at home led to several visits and attempts to win favor with the Corsican patriot leader Pasquale Paoli. In 1791, Napoleon’s election to lieutenant colonel in the Corsican National Guard led to friction with Paoli, its commander-in-chief, who eventually anathematized the entire Buonaparte family for opposition to Corsican independence, forcing their flight to France in 1793. Taking up his military duties again, Napoleon came to the attention of Maximilien Robespierre, leader of the republican Jacobins, through the latter’s brother Augustin, who was commissioner of the army. In late 1793, en route to Italy, Napoleon and his artillery unit were seconded to help drive the British out of Toulon. Against great odds the task was accomplished, and Napoleon continued to help in the region for several months. Eventually Augustin Robespierre wrote to his brother about the young officer’s “transcendent merit.” As a result, Napoleon was promoted in 1794 to brigadier general and commandant of the French army’s artillery in Italy. But he fell into disfavor a few months later when Maximilien Robespierre was ousted and guillotined in Paris and “the Directory” became France’s five-man ruling elite. At the end of 1795, Napoleon defeated a royalist uprising in Paris and was rehabilitated. His promotion to commander of the army of the interior soon led to commander-in-chief of the French army in Italy, where he waged a highly effective year-long campaign against Austria culminating in the 1797 Treaty of Campo Formio. Signing on behalf of France, Napoleon was instrumental in securing French possession of the Austrian Netherlands (modern-day Belgium) and a commitment to the left bank of the Rhine, subject to ratification by the German electors of the Holy Roman Empire. Convinced of the need to overcome the British next—the theme of the rest of his career—the young general planned an invasion of Britain. When the scheme was canceled, he sailed with the support of the Directory to Egypt, where it was thought a French colonial presence could be established. If successful, this would limit British power in the eastern Mediterranean and challenge their position in India. Though he gained initial victory against the Mamluks in July 1798, the campaign turned into a disaster when the British admiral Horatio Nelson destroyed the French fleet at the Battle of the Nile in Aboukir Bay. Despite the expedition’s ultimate defeat (the French were forced to withdraw completely from Egypt in 1801), Napoleon’s reputation soared at home. Reading the public’s disillusion with the Directory, one of its leaders, Emmanuel Sieyes, arranged the coup that brought Napoleon to power as a member of the three-man Consulate in 1799. It was a short step to his declaration as First Consul in 1801 and Consul for life in 1802, and his elevation to emperor two years later. Concurrent with his rapid elevation, the theme of Napoleon as savior—either Roman or Christian—began to appear in works of art. In an attempt to offset reports that during the Egyptian campaign Napoleon had abandoned his plague-ridden French soldiers in Palestine, in 1804 Antoine-Jean Gros painted Bonaparte at the Pesthouse of Jaffa, 11 March, 1799. The military leader is depicted visiting his dying men and touching one with an ungloved hand in the manner of Christ healing the sick, while an officer looks on, covering his face so as not to breathe in the infected air. As Gengembre observes, “The painting contributed to the divinization of the master,” which by 1804 was in full flight. Three months before his imperial coronation, Napoleon visited Charlemagne’s tomb at Aachen (Aix-la-Chapelle) and spent time there in meditation. His fascination with the “Father of Europe” was profound to the point, perhaps, of imagined reincarnation. A few years later in 1809, he told some papal representatives: “Take a good look at me. In me you see Charlemagne. Je suis Charlemagne, moi! Oui, je suis Charlemagne!” The ninth-century ruler’s influence was evident in a number of ways at the coronation ceremony. The official crown was a copy of the one Charlemagne had worn, while his sword was also used in part of the ceremony. And in his left hand Napoleon held the holy Roman emperor Charles V’s scepter, surmounted with a likeness of Charlemagne. The official paintings of the occasion show Napoleon as a Roman emperor, sometimes with a victor’s laurel wreath fashioned from gold. The extensive modeling of things Roman would not have been a surprise to many. Roman themes were already present in government attire immediately before Napoleon came to power. The painter Jacques-Louis David designed the costumes worn by the Directory and Consulate governments, based on ancient Roman dress: white togas and sashes of office. Paintings from the time of the Consulate onward show Napoleon with a hair style in the manner of the Roman emperor Titus. Following the proclamation of the empire, Napoleon adopted the Roman eagle, with wings outspread, as the national symbol. His regiments carried their colors on staffs surmounted by such eagles, presented in person by the emperor. Napoleon was enthralled with his destiny, and like other French leaders before him, he was sure that he was meant to rule not only the French people but also the Holy Roman Empire. In 1804, in response to the Napoleonic proclamation of empire, the Habsburg king, Francis II, had assumed the title “hereditary emperor of Austria” and defender of the German people. Defeated by Napoleon’s armies and deserted by several German princes, Francis realized that he could not sustain his position for long. But rather than allow Napoleon to usurp the Holy Roman Empire, he dissolved the entity on August 6, 1806, becoming Francis I of Austria. It was now impossible for anyone, especially a Frenchman, to claim the imperial title. But this did not hold Napoleon in check for long, intent as he was on dynasty and world dominion. Between 1792 and 1815 France was at war with four colonial powers: the Spanish, the Dutch, the Portuguese and the British. Napoleon’s aggression took his forces to almost every corner of the world. At the time, the conflict was thought of as the “Great War”—an almost continuous engagement, the scope of which some say qualified the period as the real First World War. In 1810 Napoleon divorced his wife Josephine, who had failed to provide him with an heir. The same year he married 18-year-old Marie-Louise of Austria by proxy, then by civil and religious ceremony in France. The daughter of Francis I, she was conscious of her duty as a Habsburg to prevent her father’s loss of the throne and was optimistic about a new life in Paris, and so she happily agreed to the marriage. In 1811, the new empress of the French provided Napoleon with the son he desired. The infant was named Napoleon and designated from birth as king of Rome. Yet Napoleon was never an overly religious person; he saw religion’s value only in political terms. Following the French Revolution, Protestantism had made inroads in France, but Napoleon, appreciative though he was of the Protestants’ help, needed to legitimate his rule by restoration of the nation’s historic relationship with Rome. Balancing these elements, the Concordat signed with the Vatican in 1801 recognized Catholicism as the nation’s primary religious identity, kept the papacy out of French political life, and allowed some freedom of religion. The agreement was not so much a demonstration of Napoleonic piety as political necessity. In May 1805 in Milan Cathedral, Napoleon gave a further indication of his intention to recover the wider ancient empire of the Romans. Once again at a coronation ceremony he took the crown into his hands—this time the “Iron Crown” worn by Charlemagne and named for the nail, supposedly from Christ’s crucifixion stake, forged into its inner band—and placed it on his own head. He was now king of Italy. From this much more powerful position, he wrote a response in early 1806 to the pope’s threat to sever relations over French interference in Italy. In a separate cover letter, he told his uncle, the cardinal Fesch, “For the Pope’s purposes, I am Charlemagne. Like Charlemagne, I join the crown of France with the crown of the Lombards. My Empire, like Charlemagne’s, marches with the East. I therefore expect the Pope to accommodate his conduct to my requirements.” In April he pressed his new advantage over the pope by issuing his own version of the catechism. The fact that he had gained the French church’s approval only made matters worse, setting the stage for further conflict with Pius VII. The pope resisted Napoleon and for over three years was treated very harshly, to the point of imprisonment and extreme deprivation. For all intents and purposes, Pius excommunicated the emperor, who in turn threatened to depose the pontiff. The impasse was resolved by Napoleon’s defeat and exile to the island of Elba in 1814. An insight into the difference between the two men is revealed in a detail from an account of the pope’s arrival back in Rome, as cited by historian Thompson: when Pius returned to the Quirinal palace, he found it redecorated by Napoleon, who had intended to use it as his own residence in 1811. One new frieze showed naked pagan goddesses, about which the pope is said to have commented, “We will give them a little more to wear and make Madonnas of them.” Napoleon’s attempt to diminish the papacy religiously and politically had not succeeded, and though he escaped from Elba in 1815 with a view to reclaiming his empire, the restored Pius outlived him by two years. Napoleon’s defeat at Waterloo in June 1815 resulted in his banishment to St. Helena. His death there in 1821 was not the end of the failed emperor’s fame, however. It might be argued that his rehabilitation began with his journey into final exile on the island. Dictating his memoirs day by day to Las Cases, he began to position himself for immortality: “I have worn the Imperial crown of France, the iron crown of Italy, and now England has given me one even grander and more glorious—that worn by the savior of the world—a crown of thorns.” In 1825, Horace Vernet painted Napoleon on His Deathbed. The emperor wears a laurel crown, his face rejuvenated and Christlike, a crucifix adorning his chest. And so Napoleon’s apotheosis seemed complete. 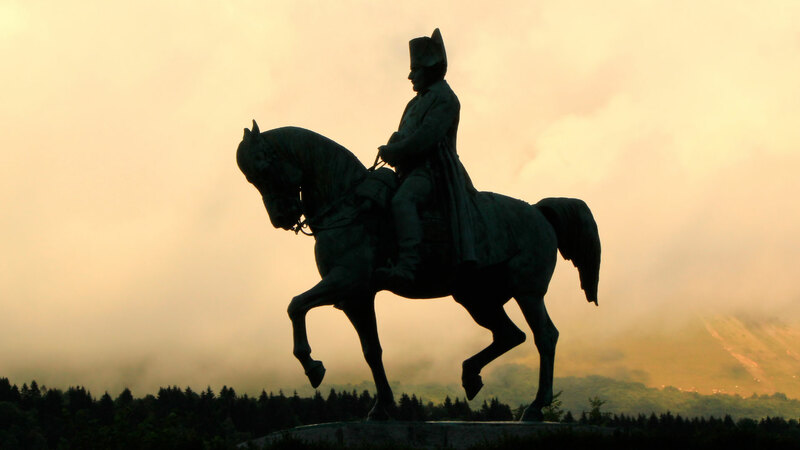 A century after his death, as the world entered the age of the great dictators, other admirers of Napoleon were on the European stage ready to take up the mantle of savior-god. In Part Seven, Benito Mussolini and Adolf Hitler. Paul Fregosi, Dreams of Empire: Napoleon and the First World War, 1792–1815 (1989). J.M. Thompson, Napoleon Bonaparte (1952, 1988).